Starting your child off on the right foot! Make learning fun by sharing experiences with your child. Do silly and imaginative things together. Make up songs about new places and new things. Don’t worry about a final product; just be joyous in the moment and praise your child’s efforts. Read to your child, and once your child starts to read, listen to him read aloud. Books can make any occasion a special one. There is a book for just about everything going on in a child’s life, from potty training to starting preschool to moving to a scary upper grade. The value of reading storybooks is greatly increased by making it relevant to real-life experiences. Obtain a library card for your child as soon as possible, and get to know the librarian in your area. Take your child to story time at local libraries and bookstores. Libraries and bookstores make it convenient for parents and children to attend their activities. There are story time hours in the evenings and on weekends for parents who work during the weekdays. Help your child dress up as a character from his or her favorite book. When the author of your child’s favorite book visits a local bookstore or library, take your child to the event so that he or she can have their book autographed by the author. Maintain a creative corner for kids. It can be a bottom drawer of a kitchen cabinet filled with crayons, rulers, glue sticks and old magazines, or a corner of the room with a nice comfy bean bag, a bookcase with your little one’s favorite books, and some tablets for keeping a journal. The possibilities are limited only by your imagination. Keep your child’s developmental level in mind, and place only age-appropriate supplies within their reach. Save your child’s artwork. Some creative ideas for displaying your child’s artwork include making a notebook by using yarn to attach each piece of paper, or fashioning it into greeting and Christmas cards. In addition, the artwork can be made into mouse pads, screen savers, calendars, clocks, puzzles, T-shirts and tote bags. Check with a local photography lab for more possibilities. Take opportunities to integrate new learning into everyday life. Help your child use new knowledge to share with others. For instance, grandmother would love a set of bookmarks made from Popsicle sticks and construction paper pictures of the continents junior has learned. Visit the school or daycare center with your child before school starts. 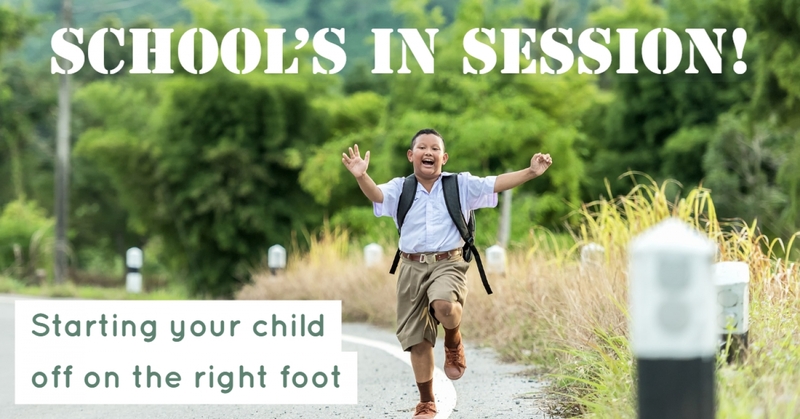 Explore all the areas that will be important to your child, such as your child’s classroom, the bathroom, the playground, the cafeteria, the school bus stop and the office. Attend open houses, school events and meet-the-teacher nights. Get to know the other parents and try to plan a “getting-to-know-each-other” activity before school starts so that the children will be more comfortable with each other. Make a daily schedule. Allow ample time for your child to get dressed so he or she is not hurried. Start early in helping your child to establish a routine. If homework comes before playtime, stick to it. Expect your children to do their best. Emphasize quality work, not grades. Review your child’s assignments. When looking at the child’s craft or project, please remember that the process (thinking, doing, feeling and experimenting) is more important than the finished product. If problems arise with your child’s assignments, talk to the child’s teacher or principal. Support school rules for discipline. Think of the teachers as partners who want to provide your child with a successful and happy experience. Let the school know of any changes that might affect your child. Read the school newsletter so that you are knowledgeable of school activities, policy changes and disciplinary rules. Help your child make learning tools conducive to their learning styles. The visual learner can write out information, make lists and use flash cards. The auditory learner will most likely prefer to be quizzed on questions they have created. They may also do well listening to tapes or explaining information to someone else. The kinesthetic learner will want to manipulate things with their hands and build models. Encourage your child to develop the other learning habits as well since they will encounter learning situations that will not cater to their preferred style. Monitor your child’s reading progress and speak to teachers about phonics and whole language approaches. This will assist you in determining whether one or a combination of these approaches is best suited to your child’s learning needs. Transitions can be hard for people, especially kids. Use some of the ideas shared above to get kids moving from a daycare setting to school, or just from grade to grade. The important ingredient is for the parent and child to plan together. Your child will take cues from you— so relax, embrace change and enjoy the experience. Laura Cobb is an education veteran of 22 years and a full-time Mom. She travels and lectures frequently on parenting and women’s issues. Her latest book Most Likely to Succeed: How to Assure Your Child’s Success in School (American Book Publishers) is available at www.pdbookstore.com or (800)296-1248. Visit Laura online at www.mostlikelytosucceedbook.com.